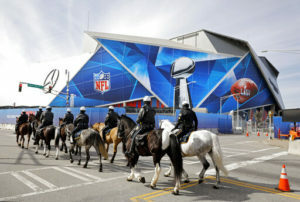 The National Football League is not aware of any security threats against Sunday’s Super Bowl, the league’s top security officer said Wednesday. The U.S. Department of Energy advised residents not to be alarmed by low-flying choppers equipped with radiation-sensing technology. The aim is to measure naturally occurring radiation to establish baseline levels _ a routine step in securing major events, the agency said.